When loading a mesh from a modeling package, texture mapping coordinates are usually included to indicate how a texture is applied to the mesh. However, when generating our own meshes, it will often be necessary to create texture coordinates based on the shape of the object. 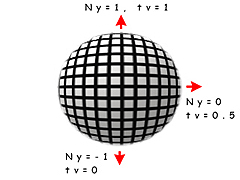 One such method for generating texture coordinates from geometry is known as spherical mapping. 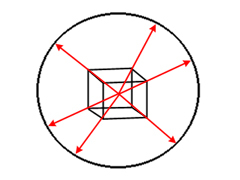 The basis of this mapping technique is to treat the object as if it were a sphere, and mapping coordinates based by determining the position on a sphere by angular displacement. In this article we'll take a look at two forms of spherical mapping, one based on normals and another based on vertex position. The result is that the coordinates are non-linear, tending to stretch the texture around the Y and Z poles while compressing it around the X poles. 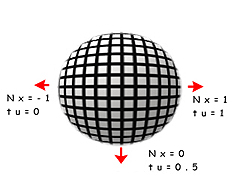 In some cases, using normals to calculate spherical texture coordinates may not be appropriate. 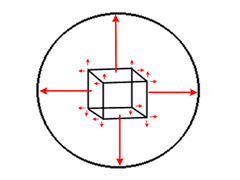 For example, objects which use face normals, such as the cube illustrated on the right, would have the same coordinates applied to each vertex of a face. Also, regions that are relatively flat on one or more axis will cause the texture to appear stretched.